Paetra (Pay-truh); from Latin for "Rock"
The basis for all great wine is the soil from which it comes. Paetra wines are crafted by intensive hand labor in the vineyard and a minimalist approach to cellar work. "As little as possible, as much as necessary" is a fitting motto. Paetra produces Riesling using traditional European techniques on American soil. On a recent visit, our man behind Paetra, Bill Hooper described how his days studying and apprenticing in Germany involved every sort of grueling task one could fit into a ten hour work day from the vines to cellar work -to scooping out the freshly decapitated bull head at Odinstal to fill it with oak bark in preparation for a Winter along a riverbank for a biodynamic preparation. Hooper has worked at a number of wineries in Germany and a number in Oregon including Brooks and now works at a vineyard management company tending many properties including some of Argyle's holdings among others tending vines, scouting for any issues and treating them, and pursuing LIVE certification on their behalf. Bill's genius taught us many things on this chummy visit but new to most if not all of us were his insights on vine hormones. Having tasted these Rieslings we can attest to the crystal clarity of th Eola-Amity, the sapid life springing from Nicholas Vineyard, and the beguiling texture and purity unique to his >O< orange wine -the only stable one we've tried to date -and beyond question the most delicious thanks to the vineyard management and cellar hygeine unique to Bill Hooper. These wines are remarkable on their own, fit for the high table, and will prove patience a virtue for those with cool, deep, steady cellars. Skol! Hip hip for the minimal intervention in Eola-Amity. This vernal Paetra Riesling is just what this trout fly fisherman is looking to pair with gently grilled Rainbow stuffed with sliced lemon and served atop a fava bean, sliced fennel and watercress -and just in time for Mother's Day. Nearly dry and absolutely nervy, this has a dynamic tension, plenty of citrus and orchard fruit and a spearmint, chopped celery frond and sugar snap pea edge to throw it all into relief and pull its chair to the table. In this glass 2014 has proven a fine year for Riesling in Willamette Valley. Spontaneous fermentation lasting 6 months preserves nuance and clarity with ample "schponti" charms and at 12.5% ABV it's all the more appetizing. Find this wine. 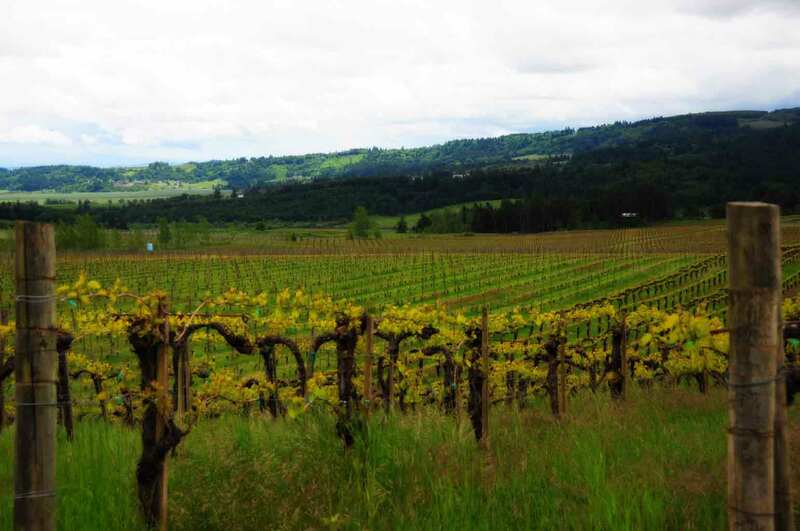 2014 provided the ideal growing season for Riesling in the Willamette Valley. Rigorous hand labor and three different harvest passes in the vineyard allowed us to produce a drier Riesling from extremely healthy and ripe grapes. Fermentation was started spontaneously and lasted over 6 months at cool temperatures. This resulted in a complex and elegant Riesling displaying a lot of texture and concentration that will reward cellaring. 310 cases produced. Pork, ham, scallops. Salmon or tuna most anyway even tartare. Asian food. An excellent wine with food. Looking for Paetra Riesling Eola Amity? Click here to discover where to find it in Minnesota! In full disclosure I have enjoyed few orange wines (think white wines of white of grey grapes that have macerated on their skins like a red wine would in terms of length of skin contact). This however is from squeaky clean Riesling that has spent a month or so on its skins until November and even so is pure and clear, citric and textural, with chirpy tannins, marmalade and apricot pastry. Even the next day it resonated round the whole palate and if anything rocked its back into its orange structure. Delicious and one of a kind. "This limed release Riesling was fermented on the grape-skins before pressing and settling. This ancient method brings a wider spectrum of aromas, complexity, tannin for structure, and an orange hue to a normally white wine. The result is a dry Riesling showing orange zest, tangerine, and floral aromas with a nice interplay between tannin and acidity. Only 24 cases produced"
Looking for Paetra Riesling O? Concentrated Chehalem Mountain Riesling from the single vineyard "Nicholas" comprised of silt on basalt that winemaker Bill Hooper credits for its thick skins and potency. Fragrant and exotic with a glorious spice I've never had this side of the Vosges. Another cracking wine from this upcoming winegrower handcrafting Riesling in this superlative category in which the fruit is in the best condition and every step of the craft is minimal but the most mindful. I am a thorough fan. "This dry Single Vineyard Nicholas Riesling was produced by hand-sorting in the vineyard only the ripest and healthiest bunches. The silt-over-basalt soils bring thick skins and an enormous concentration of tropical fruit flavors and aromas. The wine fermented at cool temperatures for over eight months without the addition of cultured yeast in neutral oak barrels. It will reward many years of cellaring. Only 45 cases produced." Asian cuisine especially spicy or with some sweetness. Also curries. Smoked or cured meats. Foie gras. Edible flowers. Looking for Paetra Gewurztraminer Van Duzer Corridor?